With the diktat accepted by the Greek government, all workers in Europe have just suffered a defeat. In Greece and throughout Europe we have to build the fightback. The signature by the Tsipras government of the agreement demanded by the Troika and the installation of a third memorandum in Greece represents an undeniable victory for the capitalist forces in Europe. This signature is a rejection of the mandate given by the Greek people through the massive OXI! in the referendum of 5 July. In that referendum, a class vote unambiguously rejected the project agreement demanded by the Troika. This vote was a strong expression of the rejection of the policies of austerity and poverty that had been implemented by the two first memoranda by conservative and social democratic parties, a rejection which had already led to the victory of Syriza in January. This about-face was apparent immediately after the referendum. Tsipras, to comply with the demands of the Eurogroup negotiators drafted a declaration of national unity with the parties subservient to the Troika (New Democracy, PASOK and To Potami) who had just been repudiated at the ballot box. The agreement accepted a few days later was even more devastating for the Greek population than the one rejected on 5 July. The European Union, the ECB and the conservative and social democrat European governments imposed an agreement dismantling what is left of social rights and establishing a real colonial tutelage by removing any sovereign decision-making from Greek national institutions. The creation of a privatization agency of Greek public goods under direct control of creditors is stepping up the selling off piece by piece of the national heritage. Resistance to such surrender was expressed after the announcement of the draft agreement by the Left platform of Syriza, a majority of members of the CC, other left forces engaged in the battle of the NO – including Antarsya activists, and many trade union reactions. The protest also involved street demonstrations, which were violently suppressed by the government and several activists were beaten, attacked by the anti-riot police, prosecuted and convicted in court simply for having demanding respect of popular decisions. These police exactions, worthy of the time of Samaras, have been supported by Tsipras and his new government. The violence of the offensive launched by the leaders of the European Union is proportionate to what is at stake: to prove, despite the democratic choice of the Greek people, that no alternative to austerity plans laid down by the European ruling class exists within Europe. One thing (above all) is clear now if it was not clear before. That is that it is impossible for a radical left government to oppose austerity inside the Eurozone today unless it is prepared to exit the Euro or be expelled from it. By linking Greece’s membership of the European Union to the respect of these dictates the true nature of this Union is illuminated: an anti-democratic construction, outside popular control and not at all aiming for upward harmonization of the economic and social situation of European populations. Its sole purpose, confirmed by the evolution of economies since 2002, is the establishment of market and monetary support for the exporting economies of the Northern countries, concretized by the deconstruction of the social rights won in every national space and endless austerity. Monetary stability has been accompanied by wage devaluation. The construction of Europe, constrained by the treaties of Maastricht and Lisbon, ”written in stone”, appears as a framework that cannot be challenged by any popular choice. The perspective opened in January 2015 was not that the Greek people would decide to cut themselves off from the other peoples of Europe, but did call into question and break with the rules of the Union. This could be a powerful hammer blows to a structure that cannot be brought down other than by the mobilization of the whole of European populations. Capitalist Europeans leaders, both conservatives and Social Democrats, have never accepted the establishment of a government whose programme is and end to austerity policies and memoranda. Syriza was a clear alternative to the policies pursued by the ND of Samaras and previously by PASOK. Its election programme clearly expressed the will to challenge the dictates of the Troika. In that respect, this political experience represented a chance for the workers, in Greece and throughout Europe, to demonstrate the possibility that a political party based on an anti-austerity programme assert itself strongly, impose itself against the reactionary parties and follow a path breaking with the demands of the European capitalists. But the months which have just passed showed that to meet such a challenge, they had to be ready for a class against class clash within Greece and also with the European ruling class, its proto-State and its banks, by challenging the illegitimate debt, the institutions and the treaties of the European Union. The Tsipras team wanted to succeed in an impossible bet: put an end to austerity in Greece while complying with the rules of the European Union and the schedule of debt repayment. By taking responsibility for the debts incurred by previous Governments and continuing in the past six months to pay more than EUR 7 billion to the ECB and the IMF, by accepting the injection of funds from emergency assistance (ELA), the Greek Government has not loosened the noose tied around the neck of the Greek people by the Troika. Yet the audit requested by the Vouli (parliament) has demonstrated that odious and illegitimate debt and had elicited the demand by many Greek MPs for immediate cessation of payment. But Tsipras refused to stop the payment of the debt, refused to block the flight of capital and refused to nationalize banks and the Greek Central Bank, the only ways to really take control of the banking system. The argument for this policy and ultimately accepting such a surrender is that this path was the only one possible to avoid suffocation of the Greek banks and bankruptcy of the country, to avoid the Grexit. Tsipras said that there was no alternative to such a choice. In recent weeks against opponents from left, he constantly put forward the argument of the currency: reject the dictates and the capitulation would, according to him, have pushed the Greece out of the Euro zone, or even of the European Union. During the legislative campaign, Syriza had as a slogan “no sacrifice for the euro”. The Euro and the ECB rules of the Maastricht Treaty, with the debt, were used as a second noose to strangle the Greek people. Avoid the Grexit, used as a threat against Greece by all European Governments, became the Tsipras government’s absolute priority, forcing it to put aside any aggressive policy on the issue of debt and the implementation of Syriza’s anti-austerity programme. The refusal to leave the euro zone has become a categorical imperative. Yet, for several months, and particularly during the campaign for the NO in the referendum, the Greek left and including the Syriza Left Platform, advanced clear proposals for another policy, a line of confrontation and breaking with the leadership and the rules of the European Union. These alternative choices emphasize social control through the nationalization of the banking system, unilateral suspension of debt repayments, blocking the flight of capital, an end to privatization, the immediate application of the social measures provided for by the declaration of Thessaloniki. Within the framework carrying out these measures which requires a battle against the Greek oligarchy and its privileges, a process of rupture with the European institutions should and must be prepared, and, given the dictates of the Troika, the preparation of leaving the Eurozone. Such a policy followed consciously could rely on mobilization and massive support in the country, made possible by the immediate implementation of social measures for the working classes. Making staying in the Eurozone an impassable frontier serves mainly as a pretext for the lack of implementation of urgent economic and social measures. In conclusion, Tsipras choices lead to continuing subjection of the Greek people to a much more dramatic social situation than the one they would face on leaving the Eurozone. The page of confrontations has not been turned in Greece. The Syriza Left Platform will fight in the coming weeks to prevent Troika winning another victory by shattering this party and its accumulated experience. And all of the anti-capitalist Greeks, in and outside of Syriza will have to find the paths of the counter-offensive, based on the experience of the united-front committees for the OXI. This concerns first of all the forces of Syriza who oppose the path taken by Tsipras, and those of Antarsya. This concerns also all the forces of the trade-union movement and the whole of the social movement which has acted on this line. The KKE, from the establishment of the Government in January, frontally sabotaged any joint action of anti-austerity forces. The other forces of the Greek left do not accept this situation which, today as yesterday, represents an obstacle to creating a single front fighting austerity. The development of the Greek situation issues a challenge to all those who want to oppose the capitalist forces in Europe. The signal is clear: there can be no challenge to the austerity policies suffered by workers without confrontation, without a process of rupture with the institutions of the European Union, and without the prospect of a Europe at the service of workers and peoples. Agreeing to the framework laid down by the treaties, hoping to be able to negotiate a reasonable agreement with the institutions is synonymous with submission to the demands of the ECB and the Commission. There cannot be any illusion on margins of manoeuvre at this level, based on possible support from the social democratic parties, or at least the hope they will take their distance from the most reactionary policies. The last few weeks have shown that Social Democrats leaders ignored the choice of the Greek people as much as their conservative colleagues. All these political forces have chimed in. Worse, the official leadership of the European Trade Union Confederation had also lined up alongside Greece’s ”creditors”, without any alternative voice within it. 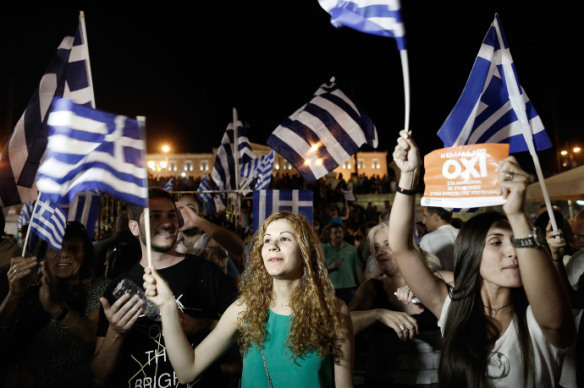 The Greek experience is a challenge in the first place to the left in the Spanish State, where the rise of Podemos was parallel to and stimulated by that of Syriza. But it also appeals to the whole of the European labour movement. Everyone understands that the capitalists’ agenda in Europe is more austerity, fewer jobs, less pay, fewer social rights. It is vital that failure of the phase which has just ended in Greece does not lead to abandoning any political perspective of radical challenge to austerity policies, or a refusal to advocate the cancellation of the illegitimate debt, a ”realpolitik” avoiding the obstacle. This would leave as alternative to the conservative and social democratic policies only nationalist, chauvinist, far-right solutions that are just as devastating for social rights. To flout the democratic choice of the Greek people, the ECB and the Eurogroup set themselves up as a European Government purporting to act on behalf of peoples. This simply showed up the total absence of legitimacy and democracy of the European institutions. Noting this obvious [weakness] forced takeover, some like Jacques Delors or François Hollande, propose the creation of a Government or Parliament of the euro zone, tinkering with the existing institutions of the Union that is only more derisory because these same institutions are, by treaties, already those related to this currency. Recent weeks have confirmed that this undemocratic and dedicated edifice in the interests of the ruling classes European should be pulled down in order to impose popular sovereignty. There will be no anti-austerity programme without an orientation of popular mobilization, confrontation and break with these institutions and the rules of the European Union. The balance of power imposed by peoples will allow the implement of such a policy by completely changing the rules of the euro, or we must prepare to leave the Eurozone. The past few weeks show that an essential part of such a policy in the European Union countries is the establishment of a coordinated, international action, setting common targets. The Greek people have remained tragically alone in recent months. It is up to European anti-capitalists to rise to meet the challenges so that the next social confrontations build a balance of power making it possible to overcome the obstacles and that the European workers’ movement, in its political, trade unionist and social forms, makes the links necessary for a Europe-wide offensive against austerity. 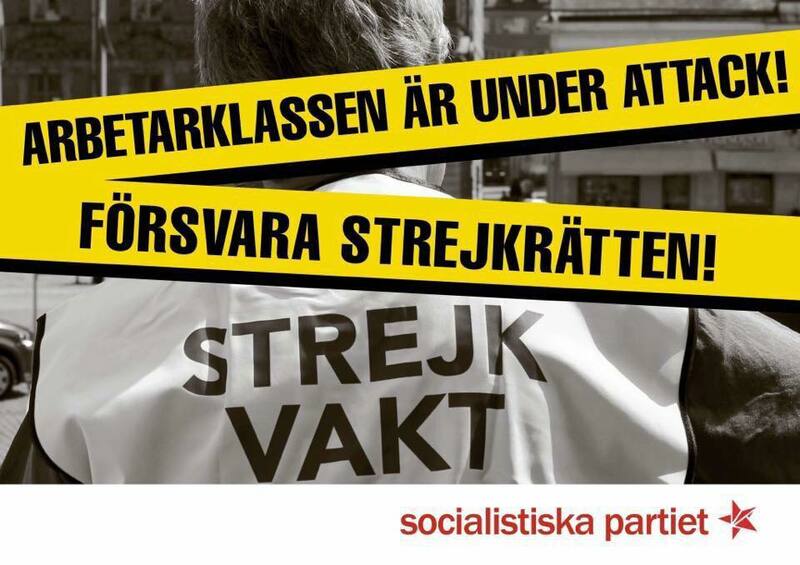 Detta inlägg postades i Politik, Uttalande och märktes Fjärde Internationalen den 2015/08/15 av Socialistiska Partiet.